There are a lot of people out there who have heard of “plantar fasciitis” but the number of people who actually know what it is, and what causes it, is much lower. Plantar fasciitis involves inflammation of a large band of tissue that connects the heel bone and the toes in your foot. This condition is most common in most common in runners, overweight people, and those who wear shoes that don’t adequate foot support. Now that you know what plantar fasciitis is, let’s discuss the causes and symptoms of it. Plantar fasciitis is believed to develop as a result of repeated, small tears in plantar fascia, as a result of the stretching and force put on the foot while walking. This can cause the plantar fascia to become weak, swollen, and inflamed. This inflammation is usually felt most when walking after a long period of sitting or at the end of a day with a lot of walking. However, why do certain people suffer from plantar fasciitis while others do not? Many cases of plantar fasciitis are caused by biomechanical factors in a person’s body. These could include high arches, tight calf muscles, tight tendons in the heels, or flat feet. All of these natural factors in a person’s body can make them more likely to suffer from plantar fasciitis. So, now that we know who is most likely to suffer from plantar fasciitis, let’s move onto what those suffering from plantar fasciitis will experience. While the most common symptom of plantar fasciitis is heel pain in taking your first steps after getting out of bed or after sitting for a long period of time, there are a number of other symptoms some suffering from plantar fasciitis may experience. These symptoms include pain that gets worse while climbing stairs or standing on toes, pain after standing for long periods of time, and pain at the beginning of exercising that goes away as the exercise continues but then returns after exercising is finished. These symptoms can cause plantar fasciitis to be mistaken for other conditions with similar symptoms, such as arthritis and tarsal tunnel syndrome. In order to diagnose a patient with plantar fasciitis, a doctor will usually do a physical examination of the foot while the patient is standing. X-rays are not helpful in diagnosing plantar fasciitis because they do not clearly show the ligament. Once a doctor has diagnosed a patient with plantar fasciitis, the best way to treat the condition is to rest your feet by limiting running or walking on hard surfaces. Equally as important to resting your feet is using orthotics in your shoes to help cushion the heel. Lastly, those with plantar fasciitis should complete daily exercises such toe and calf stretches upon waking up in the morning. These stretches can help the ligament become more flexible and stronger. 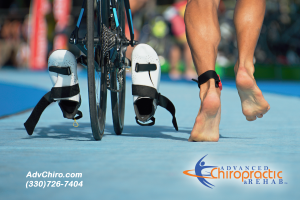 If you or someone you know has been suffering from foot pain that you believe may be plantar fasciitis, give Advanced Chiropractic & Rehab a call today at (330) 726-7404 to schedule a free consultation to see how we can help. We have been servicing the Youngstown and Mahoning Valley area since 2001 with convenient locations in Boardman, Hubbard, and Kinsman. At Advanced Chiropractic & Rehab, we are a multi-disciplinary rehabilitation group that treats work comp injuries, whiplash, sports injuries and specializes in much more than just low back pain.